We held our Statewide Awareness Walk on Sunday, September 23 at the Milwaukee County Zoo! We had perfect weather for our Mardi Gras themed party, and we had MORE participants, MORE teams, and raised MORE money than EVER before! Almost 3,000 of our closest friends joined us for a day of inflatables, carnival games, raffles, music, crafts, sno cones, rock climbing, food, and a walk around the Zoo. 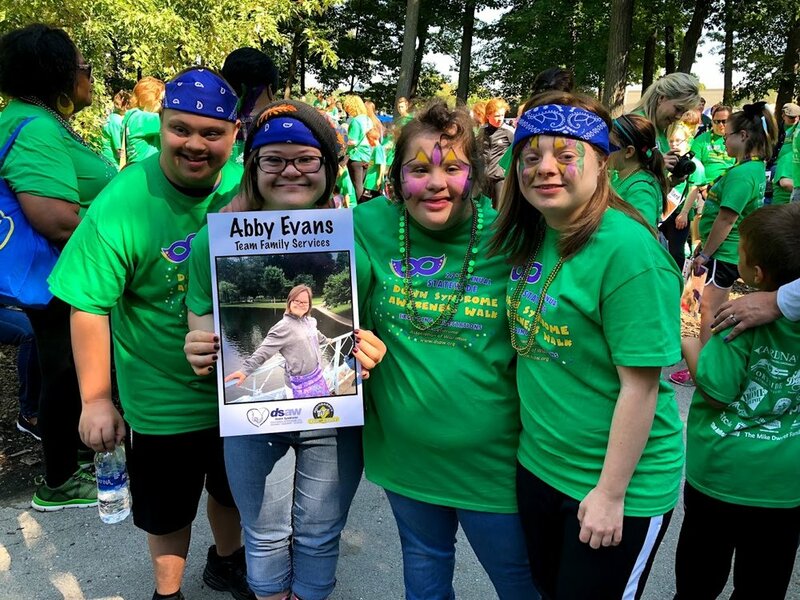 THANK YOU to everyone who made this year’s Walk so incredible - especially our sponsors, donors, volunteers, families, friends with Down syndrome, and YOU! In partnership with the Down Syndrome Clinic and Terri Couwenhoven, we sponsored puberty workshops for teenagers with disabilities! In separate sessions, boys and girls learned about sexuality and changes that happen during puberty. We’re offering a relationships class during our fall semester for individuals with disabilities. We meet on Saturdays and discuss relationships, personal boundaries, dating, and self-defense. DSAW and DSAW-Family Services also offer two sessions of a Nutrition and Wellness Class. The class meets twice a week and learns about personal health and well-being, exercise, and healthy cooking. This month at Bootcamp we all came with our favorite recipes. We got to cook and taste them and plan for the cookbook that we’re creating with everyone’s favorites! Bootcamp meets on Tuesday nights at 6pm. Join us in October! Every month on the fourth Friday, we bring our blankets, sleeping bags, pillows and teddy bears and get comfy for a Movie Night at our West Allis office! This month was no different! Join us next month!! Cooking with the Kiddos happens every first and third Wednesday at our State office! Don’t miss this chance to skip the cooking at your house! We’ll provide food for your family and practice cooking skills. Our Motor Skills Playgroup meets every second and fourth Tuesday morning from 9:30 to 11:30! This group is a fun chance for children to learn occupational therapy skills in a free environment, while parents enjoy coffee and each other's company. We’ll be starting up music therapy again in October! Sign up to join us! Our Young Leaders Academy at our West Allis office meets every second and fourth Thursday of the month. We are also have a Young Leaders Class at our Northside location in Fox Point! This location meets the first and second Fridays of the month from 7 - 9 PM! Classes start off with an energetic game and end with an hour of employment-readiness curriculum. Self-Advocates are invited to join our class anytime. Come out to Young Leaders Academy in September in West Allis or in Fox Point! The second Friday night of the month, DSAW transforms into a hoppin' place for tweens to hang out! This month at tween club we had fun with a back to school theme! We had a school-themed photobooth and made crafts. Next month's Tween Club will be on Friday, October 12. Drop your 10+ year old off for a night of games, snacks, activities, and more. Sign up to join us! Each month, DSAW parents, grandparents, and caregivers get together for a night of casual conversation and free appetizers. This month we were back at Cleveland Pub, where we’ll be for the rest of 2018! We meet every second Friday of the month in conjunction with Tween Club! Join us on October 12! DSAW-COTH-GLA hosted its Annual Awareness Walk as well this month! We had a giant luau-themed party and a gorgeous, warm September day. Everyone came out in their leis and grass skirts to celebrate our friends with Down syndrome! We had inflatables, raffles, a photobooth, yard games, lunch, and more! Thank you to all of our volunteers, donors, families, and friends! A special thank you to our Awareness Walk planning committee for all the work they did to prepare for this day! We continued our partnership with WisCorps again this month on September 30! DSAW families got together to learn about nature, enjoy a snack, and get together with other people with disabilities! DSAW partnered with the Madison Area Down Syndrome Society this year to help them throw their annual Awareness Walk! We had all new activities like a petting zoo, rock climbing wall, carnival games, inflatables, and much more! We had a hot sunny day on September 16 as we welcomed 700 people to Olin Park in Madison! FIRST Annual Down Syndrome Awareness Walk! 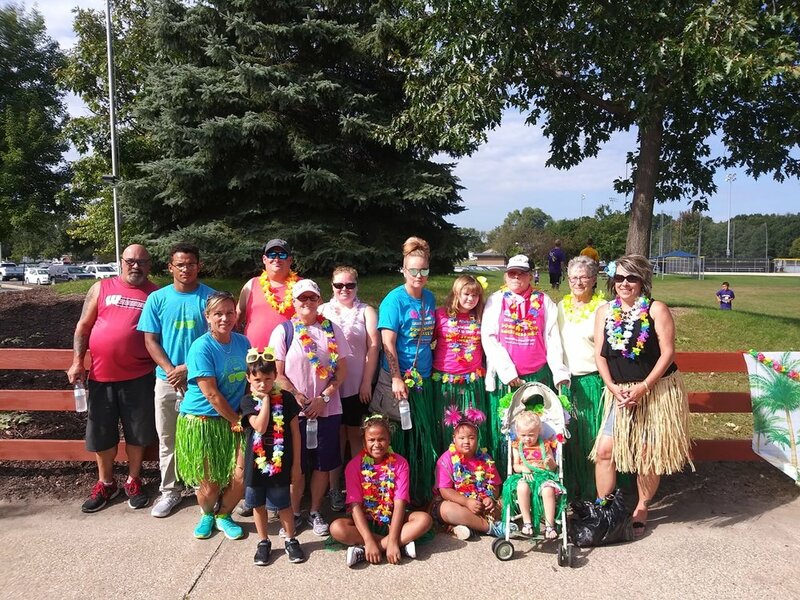 This month, we hosted the first EVER Down Syndrome Awareness Walk in Wausau! We had a fantastic turnout for the event (400 people! ), and had fun at Doepke Park with disability resource vendors, inflatables, music, raffles, top fundraising prizes, and lunch. Thank you to everyone who helped us pull off our first walk! We’re already looking forward to next year! DSAW-Chippewa Valley also hosted their Annual Down Syndrome Awareness Walk at Irvine Park in Chippewa Falls! We had a great turnout for a fun day of crafts, inflatables, family photos, a delicious lunch of pulled pork and burgers, and more. Thank you!! Families from DSAW-Green Bay traveled to Sturgeon Bay to visit Seaquist Orchards! They got to learn all about pie-making in a kitchen tour and make their own caramel apples! Everyone even got a slice of pie to bring home! We also hosted our monthly playgroup on the first Saturday of the month! This month we went to Voyageur Park in De Pere. Every month DSAW women get together for a well-deserved night out! This month we met at Heartland Pizza Company and had drinks and free appetizers! Families came together for our monthly playgroup at the Above & Beyond Children’s Museum! On the second Monday of the month, lights are turned down, noise is turned off, and exhibits are adapted for our friends with disabilities! DSAW-Sheboygan families also took a trip to Juneau to visit Waldvogel’s Farm, the largest pumpkin farm in Wisconsin! We had fun on the pumpkin trampoline, taking hay rides, doing a corn maze, and more! Happy Fall! !